‘The Walking Dead’ has a number of characters. Some would rather believe that this zombie invasion is just a passing phase, while others know that it’s not going to get better any time soon. And then others, like Shane, believe that it’s friggin’ Mad Max time. Let’s get to know them all a little better, shall we? We’ll start with the Grimes family. 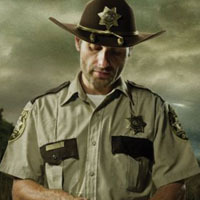 Since the pilot episode of ‘The Walking Dead’, I’ve been impressed with the way that the series handles its characters. The show isn’t simply an excuse for a zombie shooting gallery. We actually get to know these people, to understand what makes them tick and what will push them to their breaking points. Unfortunately for the show’s characters, it’s only a matter of time before the chomping hordes descend upon them. So, we take this time to see if we can learn a bit more about them, and if we’re lucky, predict their demise. Over the next week or so, we’ll take a look at a different group of characters from the show as we wait for the season to start back up again. First up is the Grimes family. Character Introduction: He’s the star of the show, the stalwart presence of right and good. He’s the character who’s not allowed to waiver much. His path is straight and narrow. With his police background, he’s taken it upon himself to keep everyone safe, and has become the group’s de facto leader. Because if we learned anything from ‘Lost’, it’s that groups of stranded people need someone to tell them what to do. Rick’s increasing “everything will be all right as long as we stay on this farm” outlook is starting to get to me. He didn’t even react when he found out for sure that his wife had been sleeping with Shane. He, like so many of the show’s other characters, has blinded himself to the fact that the world has utterly changed. People are eating people. However, in Rick’s misplaced optimism, he’s not allowed to show even the slightest ounce of defeat. He’s the hero. He’ll guide his people through this zombie plague, like a modern-day Moses parting seas of flesh-eating undead. Chances of Survival: 99.9%. There’s an advantage to being the hero and star of the show. It’s very likely that you’ll stay alive until the series is canceled or it runs its course. Rick probably has the best chance of surviving out of anyone. Think about it. Do we really believe that the show-runners are brave enough to kill him off? Nah. However, I did leave a 0.1% chance that he ends up getting chomped at some point. Even though the series abides by the standard practices of storytelling (e.g. you don’t kill off your hero), there’s still a miniscule chance it will throw us a curveball. Likely Death Scenario: Say that 0.1% chance does happen and Rick finds himself on the menu, then it’s likely going to happen whenever the show wraps up. If there’s a clear-cut ending planned out for the series, I could see Rick’s character getting killed in the final episode while trying to save Lori and Carl from an approaching horde. Character Introduction: Like any mother faced with the situation of a zombie apocalypse, Lori has done one thing, and one thing only: look after her son. (Well, she’s done two things if you count sexing up Shane when she thought Rick was dead.) Now she’s pregnant and has a penchant for being a downright hypocrite. As if Rick needed any more problems, now he’s got a nagging wife who simultaneously demands to know everything he’s thinking, yett keeps substantial secrets to herself. Chances of Survival: 75%. Why so low, you might ask? Well, Lori would be the perfect person to kill off during a cliffhanger episode. It would be the true test of the group and of Rick’s fortitude. Would he be able to live knowing that his wife is gone? 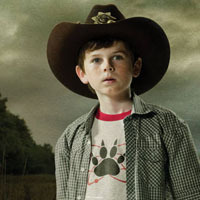 Or would he turn out just like Shane? 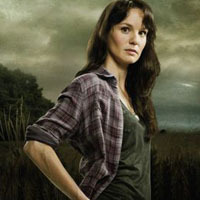 Likely Death Scenario: Lori’s is one of the few death scenes that I imagine might not be zombie related. If the show goes on long enough, or ends up progressing forward in time more than it has, then it’s likely that Lori will die in childbirth – the irony being that the very baby she thought about killing ends up being her own demise. Character Introduction: He can summon deer, and has an uncanny ability to get into trouble. He wants so badly to be like his father. It’s almost as if Carl has an angel (Rick) on one shoulder and a devil (Shane) on the other. Shane usually talks to Carl all nice-like, and tells him to watch his language and take care of his mother. But Shane’s actions may end up influencing Carl more than his father’s teachings. Chances of Survival: 90%. I don’t see Carl dying. The show has already killed off one main child character. Killing off another seems too heartless even for a story about zombies. There’s always a chance that we’ll see Carl get mauled by a pack of zombies as Rick screams a guttural “Noooooooo!” into the air, but that seems rather unlikely. I think Carl is here to stay. Likely Death Scenario: If Carl gets killed, it’s almost assuredly because he got too close to a zombie deer. Best line out of a very good right up. That Lori Death scenario is close to a certain The Walking Dead comic death. Interesting, as I’ve never actually read the comics. So, these were just my best guesses.